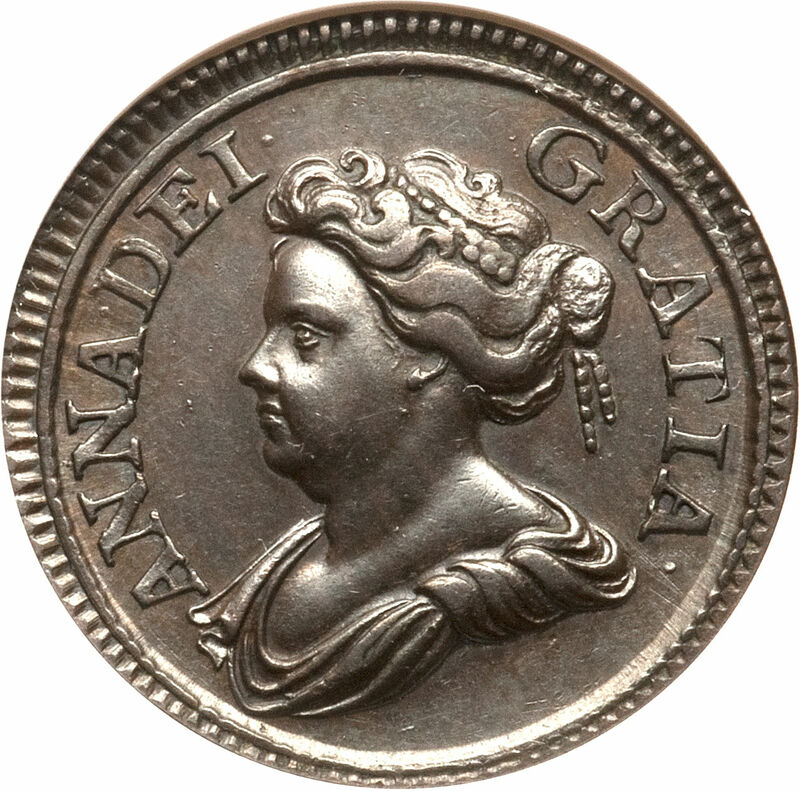 The obverse features the draped bust of Queen Anne facing left. The inscription reads "ANNA DEI. GRATIA", Latin for "Anne By the Grace of God". 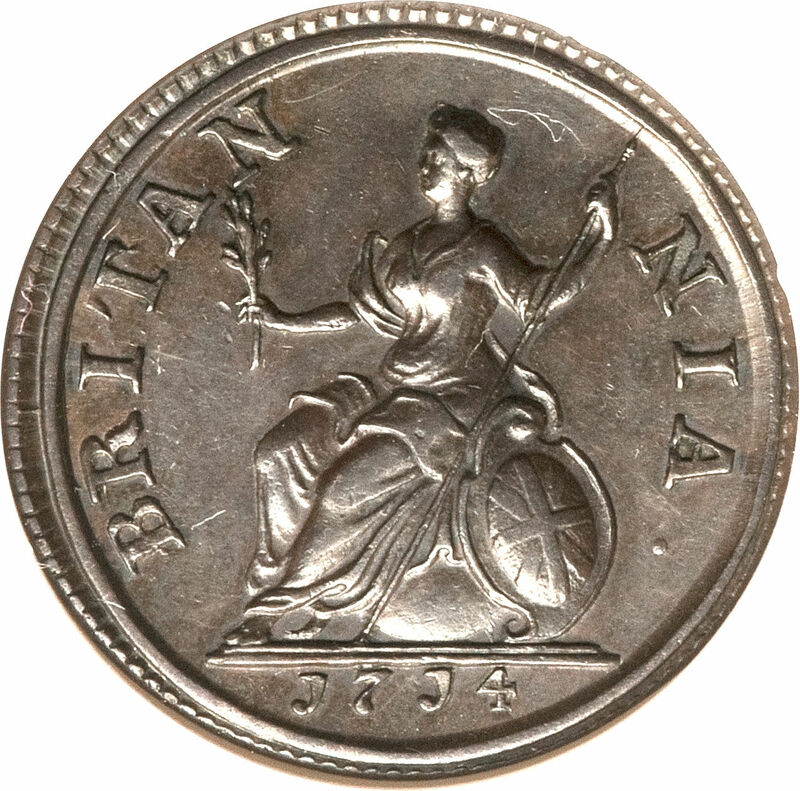 Reverse: The figure of Britannia seated, leaning on a shield which bears the combined crosses of St. George and St. Andrew; in her right hand she holds a palm-branch and in her left a spear, legend as follows: "BRITANNIA". The figure of Britannia is very graceful and beautifully executed, being the portrait of the beautiful Frances Teresa Stewart, Duchess of Richmond and Lennox (8 July 1647–15 October 1702). 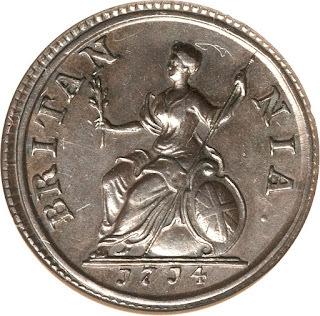 The Britannia on the farthing now became more like that of the Roman coin, from which it was originally taken. References: KM# 537, Sp# 3625. Anne (6 February 1665 – 1 August 1714) became Queen of England, Scotland and Ireland on 8 March 1702. On 1 May 1707, under the Acts of Union, two of her realms, the kingdoms of England and Scotland, united as a single sovereign state known as Great Britain. She continued to reign as Queen of Great Britain and Ireland until her death. At my goldsmith’s did observe the King’s new meal, where, in little, there is Mrs (ie Mistress) Stuart’s face as well-done as ever I saw anything in my whole life, I think: and a pretty thing it is, that he should choose her face to represent Britannia by.